A cool looking eyewear that combines both the classic and the sporty look with its pure lines and rubberized nosepiece providing a comfortable and secure fit. This eyewear is perfect for an afternoon out with your friends or for a bonfire at the beach. The great looking brown frame is perfectly matched by the amber tinted lenses. 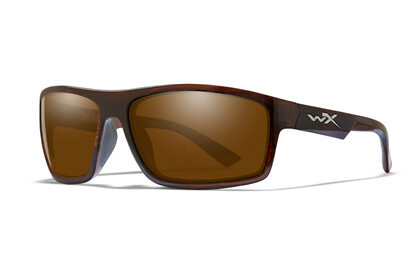 The Wiley X Filter 8™ Polarized Amber polycarbonate lenses greatly reduce High Energy Visible light and haze improves contrast and depth perception. Ideal for fishing, shooting, golf, tennis and other sports. The WX polarized lenses provides 100% UV protection and is coated with hydrophobic and anti-reflective coating protected by the T-Shell™ scratch resistant layers.